When photons interact with matter, such as when light is focused onto a sample in a microscope, it can either be reflected, absorbed, transmitted, or scattered. We are interested in this last type of light/sample interaction for the purposes of this tutorial. As the Raman scattered light carries information about vibrational modes of the molecule, a vibrational spectrum may be obtained. This allows the identification of molecules and their functional groups. Raman spectroscopy is the study of the interaction between light and matter in which the light that is inelastically scattered: a process called the Raman effect. In a Raman spectroscopy experiment, photons of a single wavelength (in the visible range this would be light of a single color) are focused onto a sample. Most commonly a laser is used as it is a powerful monochromatic source. The photons interact with the molecules and are either reflected, absorbed, transmitted or scattered. With Raman spectroscopy, we study the scattered photons. Photons interacting with molecules most commonly scatter elastically. This is called Rayleigh scattering. Rayleigh scattered photons have the same wavelength as the incident light. However, approximately 1 out of a million photons are inelastically scattered...an effect first described by Sir Chandrasekhara Raman in 1922. With Raman scattering, the incident photon interacts with matter and its wavelength is either shifted lower or higher (red or blue shifted, respectively). Red shifted photons are the most common, having been subject to a "Stokes shift". What has happened is that the photon has interacted with the electron cloud of the functional groups bonds, exciting an electron into a virtual state. 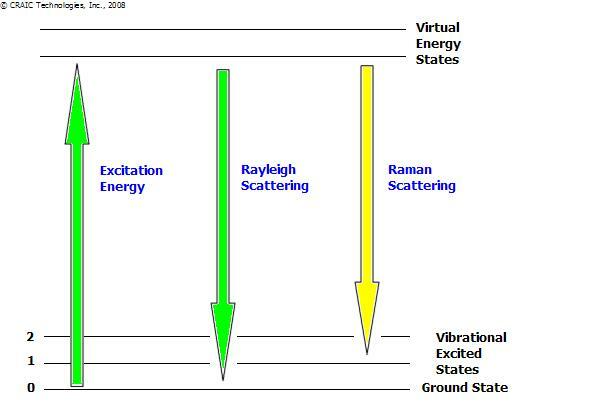 The electron then relaxes into an excited vibrational or rotational state (see the diagram). This causes the photon to lose some of its energy and is detected as Stokes Raman scattering. This loss of energy is directly related to the functional group, the structure of the molecule to which it is attached, the types of atoms in that molecule and its environment. Of course, not every molecule or functional group exhibits Raman scattering. Factors such as the polarization state of the molecule (which determines the Raman scattering intensity) must be considered. The greater the change in polarizability of the functional group, the greater the intensity of the Raman scattering effect. This means that some vibrational or rotational transitions, which exhibit low polarizability, and will not be Raman active. They will not appear in a Raman spectra. Raman microspectroscopy is where a Raman microspectrometer is used in place of a standard Raman spectrometer. A Raman microspectrometer consists of a specially designed Raman spectrometer integrated with an optical microscope. This allows the experimenter to acquire Raman spectra of microscopic samples or microscopic areas of larger samples. The advantages are that much less samples is require and certain effects may also be enhanced over very localized regions. It should be noted that Raman scattering is a very weak effect as most photons are Rayleigh scattered. However, the intensity of the effect can be dramatically increased with resonance Raman spectroscopy. In resonance Raman spectroscopy, the wavelength of the exciting laser light coincides with the absorbance maximum of the molecule or functional group. Therefore, the photon can excite an electron to near an electronic excited state rather than a virtual excited state. This results in an increase in the Raman scattering intensity by a factor up to a million. This transition is therefore dominant in the resultant Raman spectra: the Raman spectra is of the molecule whose absorbance corresponds to the wavelength of the laser. This is why Raman microspectrometers are often offered with multiple lasers with differing laser wavelengths: different samples may be excited at different wavelengths in order to obtain the strongest Raman signal. Surface enhanced Raman spectroscopy (SERS) is another method of signal enhancement for Raman spectroscopy. The most important factor of this technique is sample preparation. Sample molecules are adsorbed onto specially prepared metal surfaces. These surfaces are "rough" on the nanoscale and are usually either gold or silver. Raman microspectra™ can then be taken using standard methodologies but with signal enhancement of approximately a trillion. However, the correct laser wavelength must be selected that best interacts with the metal surface in order to see the SERS effect.